With Wet-Dry-Try, children learn and practice correct formation habits for writing capitals, numbers, and lowercase letters. 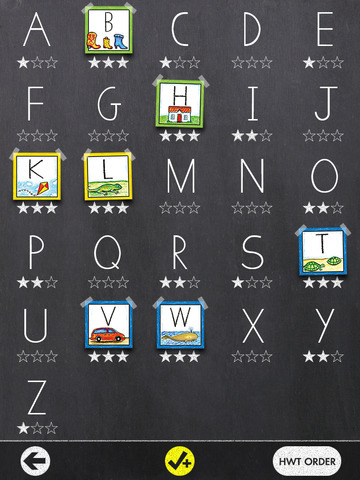 The app simulates our Slate Chalkboard and Blackboard with Double Lines and helps children learn handwriting skills in the easiest, most efficient way. 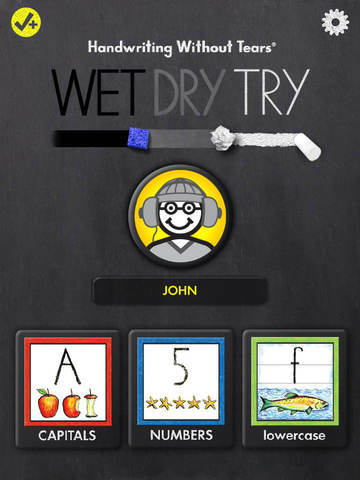 Based on the popular Handwriting Without Tears program, Handwriting Without Tears: Wet-Dry-Try Suite for Capitals, Numbers & Lowercase (Classroom edition) the app, is a great supplement to the hands-on resources and workbooks from HWT program. The consistent language used for the last 30 years in HWT will be familiar for many. As part of its multi-sensory experience, the handwriting program also uses a chalkboard and the Wet-Dry-Try method to teach children how to write. This app is a virtual adaptation of this popular handwriting system. 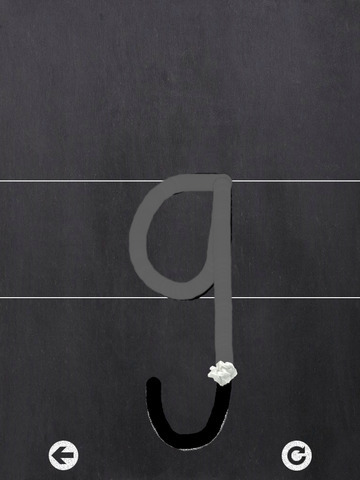 Using a virtual chalkboard, a three step process of tracing is used to complete the letter or number formation. Before the child begins to trace, a friendly voice demonstrates the formation in a clear and concise manner which follows the specific HWT language. The letter ‘p’ For example, “Dive down, swim up and over around bump”. The child is then asked to copy the formation by using a wet sponge to clean the blackboard; this is followed by drying the blackboard and finally forming the letter with chalk. In each of the three steps, the child needs to form the letter with increasing accuracy. Upon doing this correctly, a star (one of three) is rewarded. Gaining three stars requires increased formation accuracy, once a child has received three stars they receive a colourful lettercard.. Friendly praise is given by the coach throughout and if the child is unsuccessful then gentle encouragement is given to try again. Lowercase letters include two writing lines to support the learner. The numbers and upper case sections follow the same process but without the lined support. As you would expect from the HWT program, excellent support is available for both teachers and parents, which include videos tutorials and audio instructions through the developer’s website. The lite version only gives you access to certain letters and numbers from the program. Further letter groups and numbers can be obtained through in-app purchases. I would recommend purchasing the student licences which last for a year. This licence gives you access to the +Live insights section, a digital dashboard that gives you real time, web based progress reports for each of your pupils and suggestions for next steps in learning. The additional purchase will also allow you to print and share progress reports with parents, colleagues and your pupils if you wish. Further technical support and tutorials are available upon buying the licence. I would only recommend this application for use with children who have strong pre-writing skills. For those who don’t with poor fine motor skills it may be a little frustrating due the accuracy required. Beyond this level, Handwriting Without Tears: Wet-Dry-Try Suite for Capitals, Numbers & Lowercase (Classroom edition) is a wonderful and engaging application and a must have for children who find handwriting frustrating. Make handwriting practice fun! With Wet-Dry-Try, children learn and practice correct formation habits for writing capitals, numbers, and lowercase letters. The app simulates our Slate Chalkboard and Blackboard with Double Lines and helps children learn handwriting skills in the easiest, most efficient way. The result truly is handwriting without tears! - A proven multisensory approach teaches children to write letters and numbers with correct habits and without reversals. - Children can practice letters in any order they choose, or follow the HWT Order, which presents the letters in the proven Handwriting Without Tears® developmental teaching order. - A personal coach helps children with friendly audio cues to learn formation steps and fix mistakes. - Student-created avatars let children personalize their learning, and help them easily identify their accounts. - Each letter has three levels of difficulty that build skills progressively. Master a level and win a star. Earn three stars and win a letter card. Collect them all to win the grand prize! - The two options for sensitivity allow parents and educators to adjust the writing tolerance depending on each student’s needs. 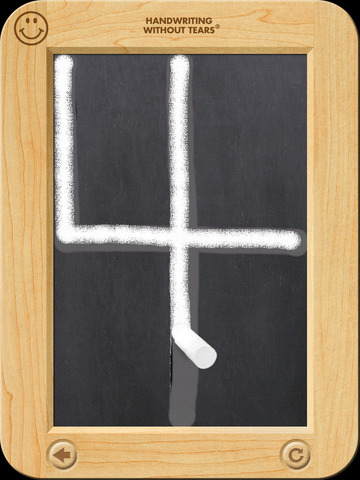 - The smiley face and Slate Chalkboard frame promotes good handwriting and reading habits for capitals and numbers. - Lefty-friendly setting lets you adapt horizontal cross-strokes to make their handwriting easier. 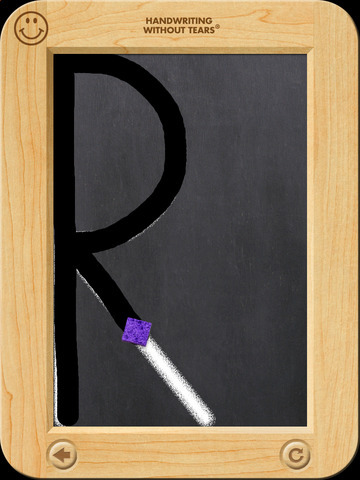 - The double lines, modeled after our Blackboard with Double Lines, make it easy to understand where lowercase letters start and end.